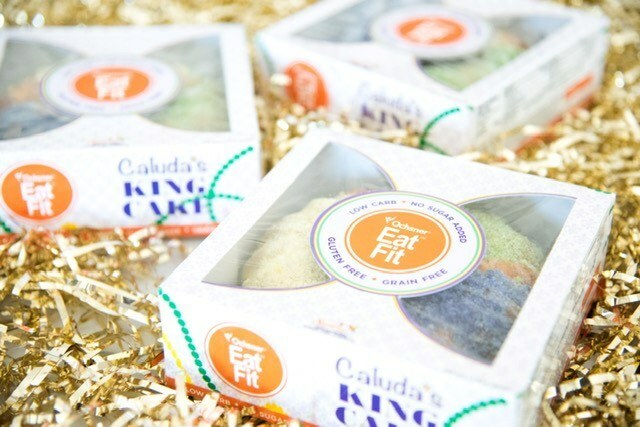 EatFit BR's king cake described as "pound cake meets king cake." Photos courtesy Ochsner Clinic Foundation. It is sticky, ooey, gooey, sweet and delectable. Its round and fluffy exterior is coated with a thick layer of creamy icing and topped with purple, green and gold sprinkles that you often find on your kitchen floor for weeks to come. I’m sure there is no doubt in your mind you know what I’m describing (as my mouth is watering): the one and only Mardi Gras king cake. This coffee and French pastry hybrid originated in old-world France and Spain, making its way to the Big Easy in 1870. Its unique color combination is tied to its Christian roots with purple signifying “justice,” green signifying “faith,” and gold signifying “power.” What this rich cake also signifies is the beginning of a month-long celebration filled with unyielding indulgence. Let’s be honest, it’s almost impossible to limit yourself to one king cake. Lucky for us, Molly Kimball, registered dietitian and founder of the Ochsner Eat Fit program (supported by the Blue Cross and Blue Shield Louisiana Foundation) has partnered with John Caluda of Caluda’s King Cakes and Cottage Catering to orchestrate a deliciously gluten-free, grain-free, low carb and keto-approved king cake. 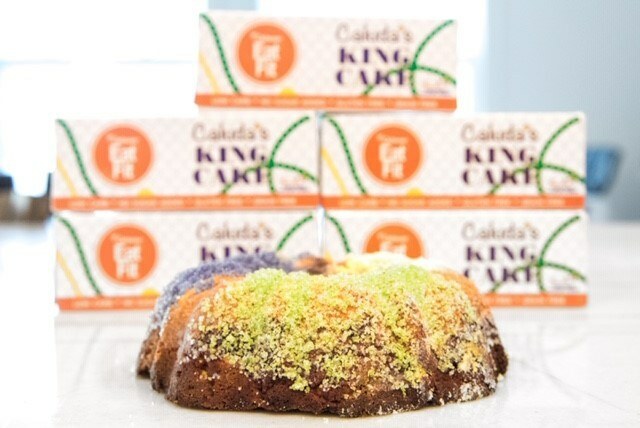 “Molly Kimball was heavily inspired to create this king cake after receiving a lot of requests for healthier options,” says Eat Fit BR dietitian Vanessa Richard. Typically, these cakes are made with white flour that is intricately mixed with cinnamon and sugar before finding a temporary home in the oven. Bakers also have the option to fill the pastry with cream or fruit and then smother it in candied fruit, icing and colored sugar once it is ready for serving. But Richard explains that the Eat Fit cake “contains no white flour or white carbs and less than 5 grams of added sugar.” It is the perfect guilt-free substitute, therefore, for the local health nuts and carb-conscious Louisianans who have a limited carb intake, strict diet, heart problems and diabetes. The Eat Fit king cake is created with all-natural and clean ingredients that include almond flour, coconut flour and Greek yogurt. The icing is sweetened with Swerve, a natural, plant-based sweetener made in the heart of New Orleans. The cake lacks the artificial sweeteners and food dyes that our American tastebuds are so used to consuming. The main takeaway from this information: if I had not told you it was so nutritious, you would have no idea that this cake is holistically different. Richard describes the taste as “not brioche, more of a pound-cake king cake with a sweet cinnamon ribbon running through the center.” She also cautions: “Expect the texture to be different, but it still gives you that great king cake flavor with the granular sugar topping.” Thanks to the Greek yogurt, it is incredibly moist with a soft, tender crumb and not grainy like the whole-wheat substitute king cakes that attempted to dominate the health food scene. Baton Rouge residents can find this one-of-a-kind cake at Alexander’s Highland Market priced at $12 to $15 and discover for yourself what makes this treat so coveted. Currently, the demand is so high that it is exceeding production and Caluda’s is working to increase production within the next few weeks. We recommend you check cake availability through Instagram or the Eat Fit app, or call Alexander’s directly since supplies are limited. To learn more about Eat Fit BR and Vanessa Richard, check out this story from the inRegister archives.